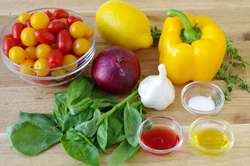 Let’s commingle cultural traditions by turning classic Mexican salsa ingredients – tomatoes, peppers, and onions – into an Italian affair with the addition of roasted garlic, fresh basil, and oregano. If you plan ahead and have a head of roasted garlic ready to use, this salsa is a cinch to make on the day of the party. Roasted garlic is a boon to the calorie-conscious cook because it adds big flavor but few calories. As you’ll see, only a minuscule amount of olive oil is used in this recipe. I love to serve this salsa as a dip, but I also adore it as an accompaniment to grilled halibut skewers or pan-seared red snapper. 2. 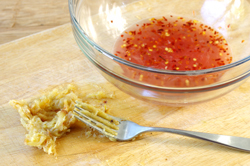 In a medium bowl, whisk together the lemon juice, vinegar, salt, and crushed red pepper until the salt is dissolved. Remove the warm cloves of garlic from their skins and add to the vinegar mixture. Using a fork, mash the roasted garlic until pureed smooth. Whisk in the olive oil. 3. 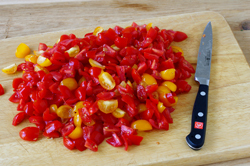 Add the tomatoes, bell pepper/capsicum, and onion and gently mix to coat with the dressing. Fold in the basil and oregano. Taste and adjust the seasoning. Transfer to a serving bowl, cover, and set aside for at least 1 hour to allow the flavors to meld. 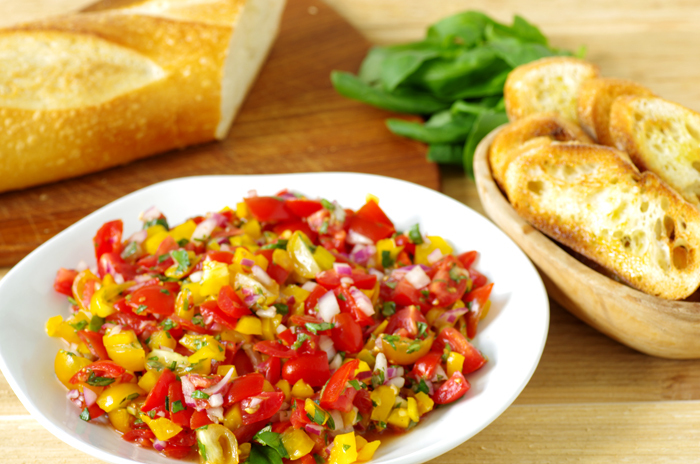 DIP DO-AHEAD: This salsa can be prepared up to 8 hours in advance. Cover and refrigerate. 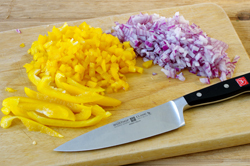 Remove from the refrigerator 45 minutes before serving. Peel the loose, papery outer layers of skin off 2 heads of garlic and trim any roots from the bottom. Cut off enough of the top of the garlic heads to expose the cloves. 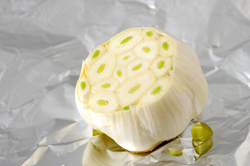 Place each head of garlic on a sheet of foil large enough to completely enclose it, with a little extra foil left over. Drizzle each head with 1 teaspoon of olive oil and sprinkle with a little salt. Wrap the foil tightly around the bulbs, twisting it closed at the top. Place on a small, rimmed baking sheet/tray and roast until the garlic feels soft when pierced with a knife, about 45 minutes. Open the foil packages and bake until the garlic cloves begin to pop from their skins and brown, about 15 minutes longer. Remove from the oven and let cool. Squeeze the roasted garlic cloves from the skins. Store, tightly covered, in the refrigerator, for up to 3 weeks.